Phoenix Wedding Photographer Jerry Ferguson Photography is one of the top Phoenix Wedding Photographers and also photographs weddings, engagements, senior portraits, family photos, baby pictures, corporate photography, product images, and other types of photography in the Metro Phoenix area and the surrounding communities of Mesa, Tempe, Scottsdale, Chandler, Gilbert or other cities in Arizona like Sedona and Tucson. Jerry Ferguson Photography is also available for travel worldwide. This high end Phoenix Arizona wedding photographer has surprisingly good prices. Packages are available for every budget. Jerry Ferguson Photography has photographed weddings at just about every venue in the metro Phoenix area, and surrounding cities of Mesa, Scottsdale, Gilbert, Tempe, Chandler, Carefree, Glendale, Avondale, Paradise Valley and other areas of the valley. We photographed this couple today at the Mesa Arizona Temple near Phoenix, Arizona. For these photos we wanted to evoke a painterly ‘Caravaggio’ feel, so we used a soft/hard lighting scheme in combination with some late afternoon sunlight. The lighting is really the key here. Sarah and Jerry teamed up on this one, with Sarah clicking the shutter as Jerry arranged lights. Perry Sevey shot did some wedding videography, and did an excellent job as always. For the photo above, Jerry was actually hiding behind that tree on the left, holding a flash which is providing the ‘spotlight’ on the bride and groom’s faces. Another flash was placed behind a shoot-through umbrella camera-left to provide just a touch of fill in the shadows. And the sun finished off the rest of the photo, providing that warm glowing light from the right side of the photo. The photo above is a fun shot of the groom spinning the bride. Gilbert Arizona Temple Wedding photography is our specialty. We shot this wedding at the Gilbert Arizona Temple, it was the first wedding actually photographed at the still-unfinished temple that we could find online. The Gilbert Arizona Temple (LDS, or 'Mormon') temple in Gilbert, AZ is a special place where most LDS members in Gilbert and the surrounding communities get married. If you are planning your wedding at the Gilbert AZ Temple, please consider us for your photography. Jerry and Sarah (the Phoenix engagement photographers at JerryFergusonPhotography.com) teamed up again on this shoot for some Phoenix engagement photos. Sarah scouted an excellent location in a wheat field near Williams Field Airport. Jerry and Sarah switched off shooting and lighting, holding a strobe in an umbrella above Chase and Kaela and using the awesome Arizona sunset as our backdrop. Please let us know if you'd like us to shoot your wedding or engagement photos. You can learn more about our engagement photo shoots at this link. We love shooting senior portraits in Arizona. 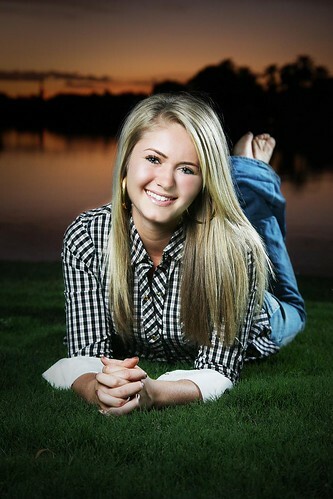 We photographed Erica's Senior at Val Vista Lakes in Gilbert Arizona. She dances, and we wanted to evoke the feeling of stage lighting with the lights that we used. We shot until well after sunset, but came back with some spectacular images.